There’s a rhythm to the road enjoyed by self supported cycling tourists. We only ever have a general idea of where we may finish each day’s ride as there are too many variables to consider, although the weather isn’t usually one of them. 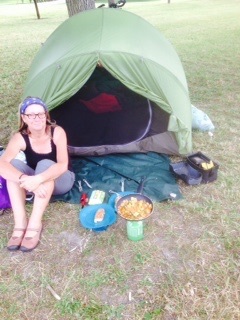 Sometimes we are quite happy to plough on in the rain, with the knowledge that a dry tent and a camp cooked meal awaits us- even if it’s us who have to cook it! We keep an eye out for interesting places and sometimes you just feel like staying in a village that you may otherwise ride through. That’s the beauty of having unlimited time to travel. In the comic strip Peanuts Linus had his security blanket, I have my Terra Ferma Tarp, which has served me well on many cycling trips: As ground sheet, blanket, wind break, tent and trusted piece of kit. Perhaps it’s not so surprising that an inanimate object can be ascribed such status. We tend to love things like our cars, our homes, our stuff as much as people. I routinely check the bikes each evening and again in the morning for any signs of trouble. Every few days I give them a more rigorous service. 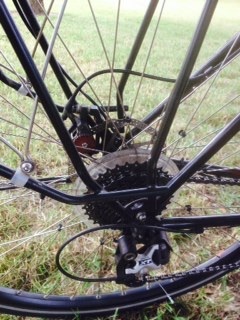 An American touring cyclist I met, showed me how he had attached cable ties on the inside drive side of his rear wheel. He said it was an old track cycling trick to avoid broken spokes when the bikes under pressure. I thought it sounded plausible so have done the same to our bikes. Not that I have had any broken spokes as yet, my only real issue has been indexing the gears and doing a little cable adjusting. The BB7 disk breaks are easy to adjust. I’m always tinkering at the end of the day and not just with myself! We carry everything we need to be self supporting. The poles on our MSR Mutha Hubba tent need a fine coat of grease or oil every couple of weeks to ensure the connections fit easily. We carry extra food and cooking gas just in case the bakery isn’t open. The Sleeping bags and inner sheet need a good airing regularly, along with myself! In short there are lots of practical tasks that need to be undertaken to make for a good day’s cycling and a great ongoing bicycle tour. One of the real joys of cycle touring, apart from those that commonly spring to mind, is the growing confidence and self sufficiency that comes from meeting and overcoming the daily challenges which are part of life on the road. We found a quiet plaque de camping in Rhinau. It’s a beautiful 13 century village just of the Channel de Rhine. 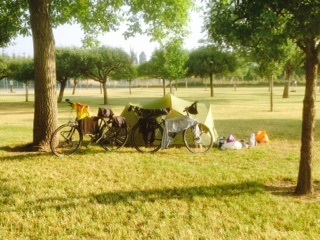 We are camped under a pear tree (I do like a juicy pear) in a former orchard. I’d like to stay here for a day or so. You’ve pretty much nailed our attitude when on the road. We’ve just returned home from a year-long tour and we’re struggling to return to the ‘normal’ cycles of daily living. I just want to get back out on the road where simplicity is the rule looking for the next bakery our primary task! That’s what we are afraid of! 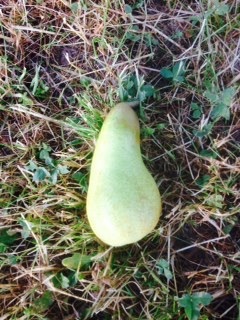 What is it you like so much about a juicy pear ?